bold and outgoing. Some are lazy, while others seem to be constantly in action. 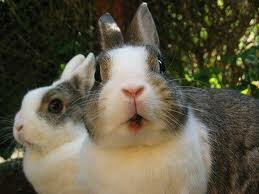 In fact, there are probably as many different rabbit personalities as there are rabbits! Getting to know your rabbit and learning to understand your rabbit’s behaviour is the key to building a solid relationship with him. To earn your rabbit’s trust, start by spending some time on the floor with him, and interact with him at his level. For example, you could sit on the floor and read a book. Rabbits are very curious by nature, and even a timid rabbit will not be able to resist investigating you. Don’t make sudden movements and your rabbit will approach you more often. Knowing what is normal behaviour for your rabbit can also be instrumental in catching an illness at an early stage. If a once calm, adorable bunny starts to misbehave and become destructive, you need to analyze the situation to determine what has changed or gone wrong. Your rabbit is trying to communicate and it’s up to you try to understand. For more detailed information on “rabbit speak” visit the Language of Lagomorphs website.